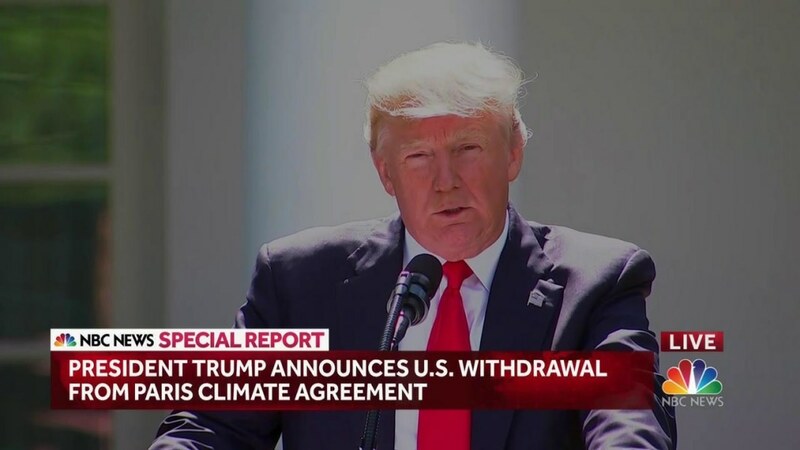 U.S. President Donald Trump has withdrawn the country from the historic Paris Climate Accord dealing with greenhouse gas emissions mitigation, adaptation and finance starting in 2020. Trump, in a nationwide broadcast on Thursday, said U.S. would either seek re-negotiation or remain withdrawn from the agreement that went into effect on November 4, 2016. Trump had promised to make his decision known this week on the Paris Climate Agreement, which as at May 2017, 195 members of UN Framework Convention on Climate Change, had signed and 147 had ratified. “The United State under Trump will continue to be the cleanest and the most environment-friendly country on the planet. “Or in really entirely new transaction or terms that are fair to the United States, its businesses, its workers, its people and its tax payers. “So, we are getting out but we will start to negotiate and we would see if we could make a deal that is fair and if we can, that’s great and if can’t, that’s fine. “As President, I can put no other consideration before the wellbeing of the American citizens. The Paris Climate Accord is simply the latest example of Washington entering into an agreement that disadvantages the United States. “For the exclusive benefits of other countries, leaving American workers, who I love, and tax payers to observe the cost in terms of job loss, low wages, shattered factories and vastly diminish economic production. “Thus, as of today, the United States would cease all implementation of the non-binding Paris Accord and the draconian financial and economic burdens the agreement imposes on our country. According to him, compliant with the terms of the Paris Accord and the onerous energy restriction that is placed on the U.S. could cost America as much as 2.7 million job loss by 2025. Trump explained that he would immediately work with democratic governments to immediately get together and re-negotiate the Paris deal. But until we do that, America remains out of the agreement. He said the agreement was unfair to the U.S., adding it sought to cripple the U.S. and empower China, India and other developed countries, and called for a deal that is equitable. Trump pointed out that with the current agreement, China and India could continue to increase their pollution for a decade or two without penalty while the U.S. could not.